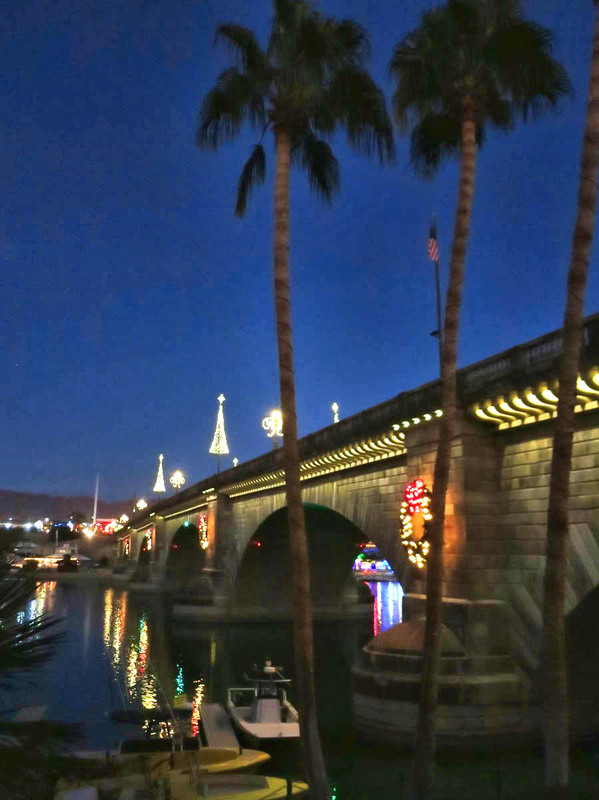 I had multiple reasons for hanging out in Lake Havasu for a couple of weeks before storing my Winnie in Phoenix to fly back to Texas. First and foremost was to accept Joel and Kathy’s gracious invitation for Thanksgiving. And it was an opportunity for one last meet-up with Debbie and “The Heathens” Rupert and Elliot, before they headed south for the remainder of the year. But also, there was to be a parade! 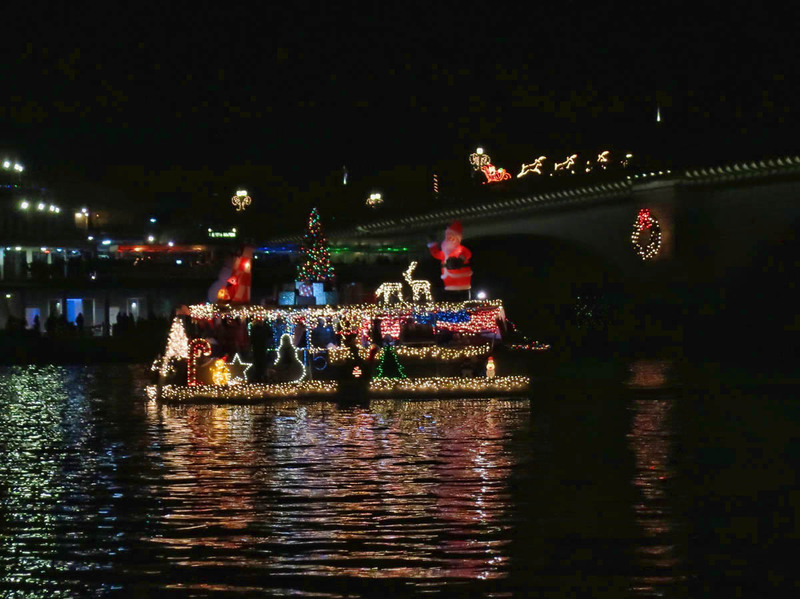 And not just any parade, but one with boats! 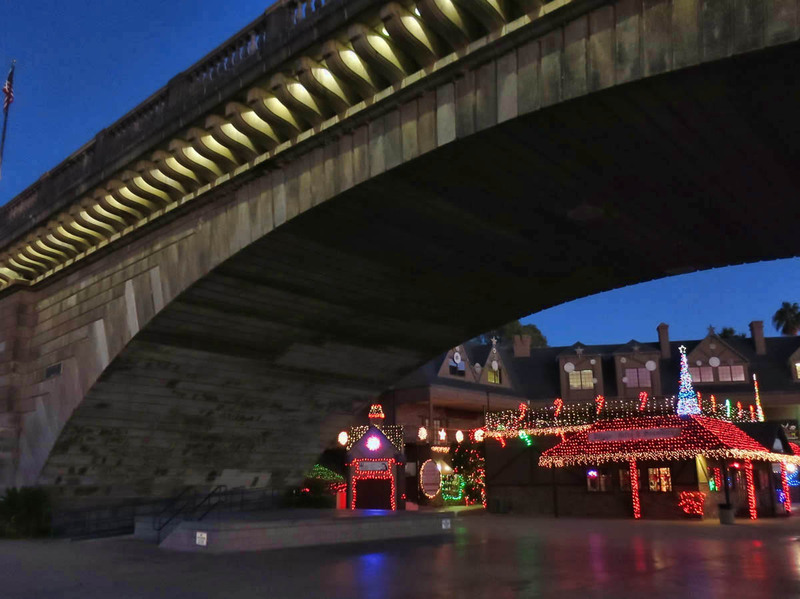 The English Village beneath London Bridge. The English Village taken from London Bridge. Once Debbie left on her southerly migration, I also departed our boondocking spot and moved into the Lake Havasu State Park. At $30 a night, it was a bit of a splurge for me, but it was my first paid site with hookups since Moab in mid September, so I was due for a splurge. But my primary reason for moving into town was to better position myself to watch the upcoming parade which terminates at the State Park’s Windsor Beach. Getting the Sea Scouts boats ready for the parade. 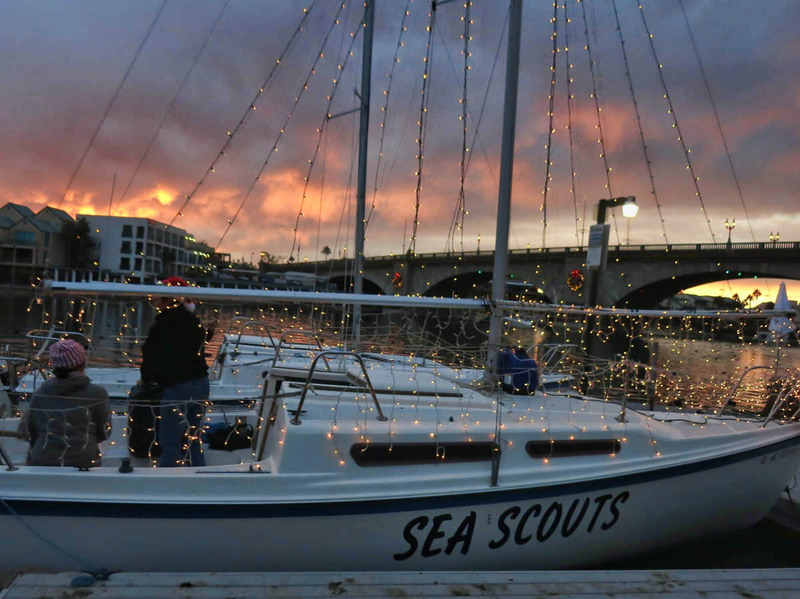 Sea Scouts have three sailboats from donors. Two will be in the parade this year. 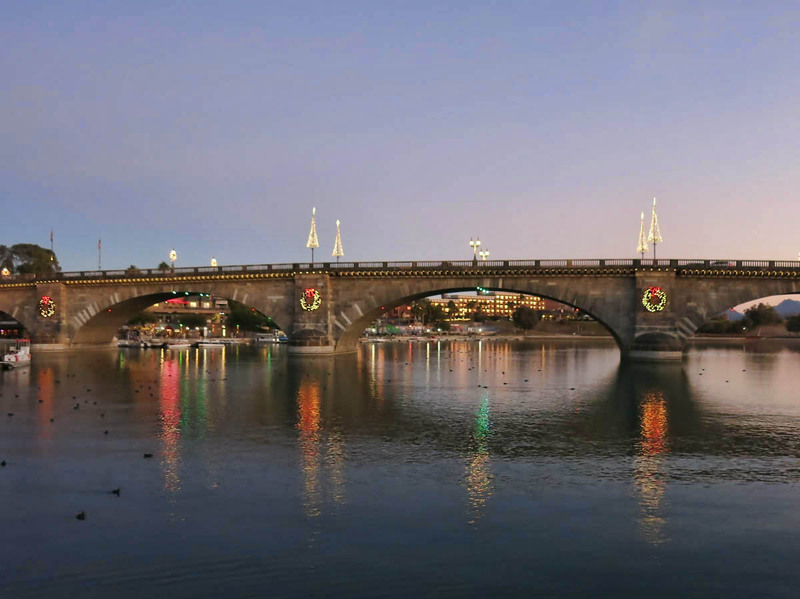 Kathy, a certified boat captain, heads up the Lake Havasu Sea Scouts program, a division of Scouts that teaches young adults boating skills. 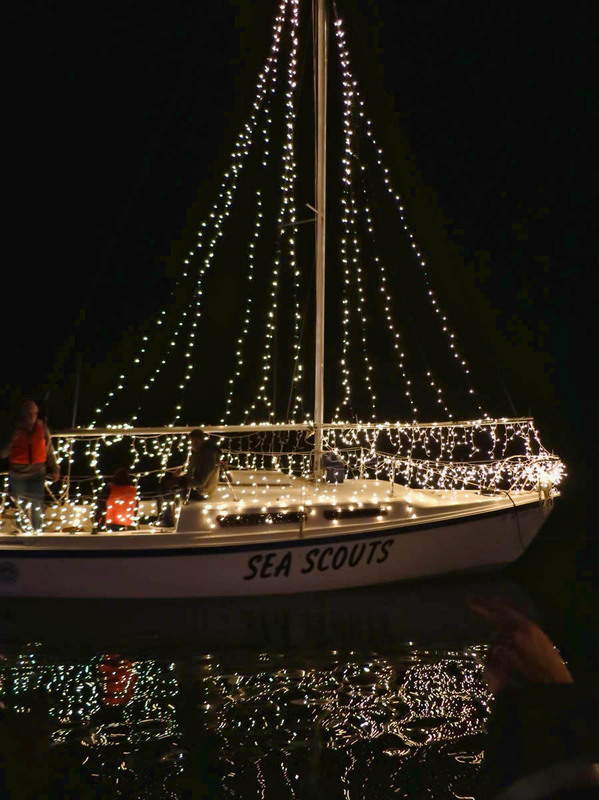 The Sea Scouts would be participating in the first night of the parade, so Captain Kathy invited me to ride on one of their boats! 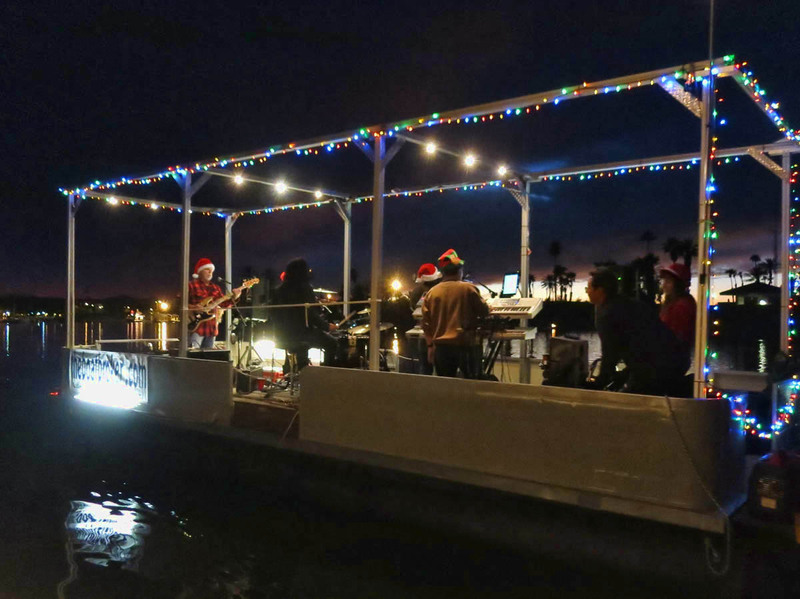 This barge has a live (and very loud!) band playing. Lining up with the other sailboats to bring up the rear. I was to report for my position at 5pm, just prior to sundown to help the scouts prepare for launch. 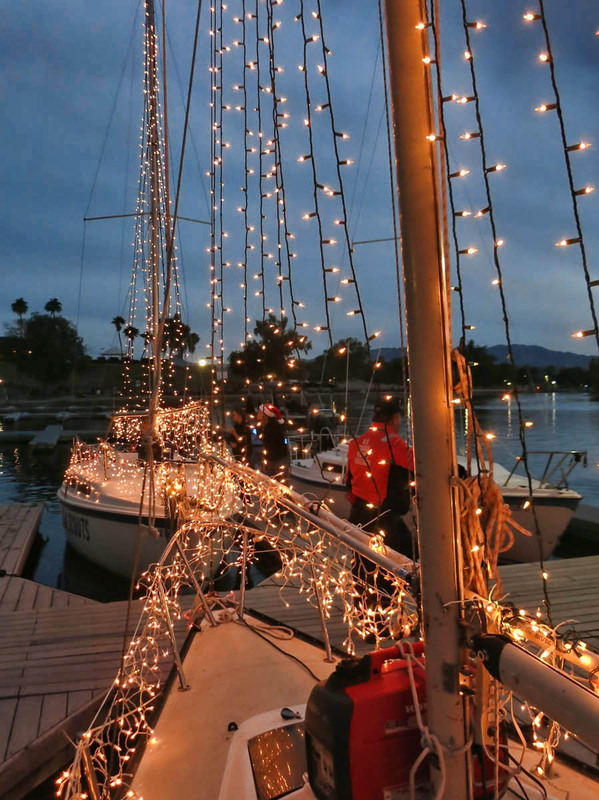 My job was to check the strands of lights draped from the mast, boom, and life lines to make sure there were no outages, while Kathy’s son Jona got the motor and generator powered up. 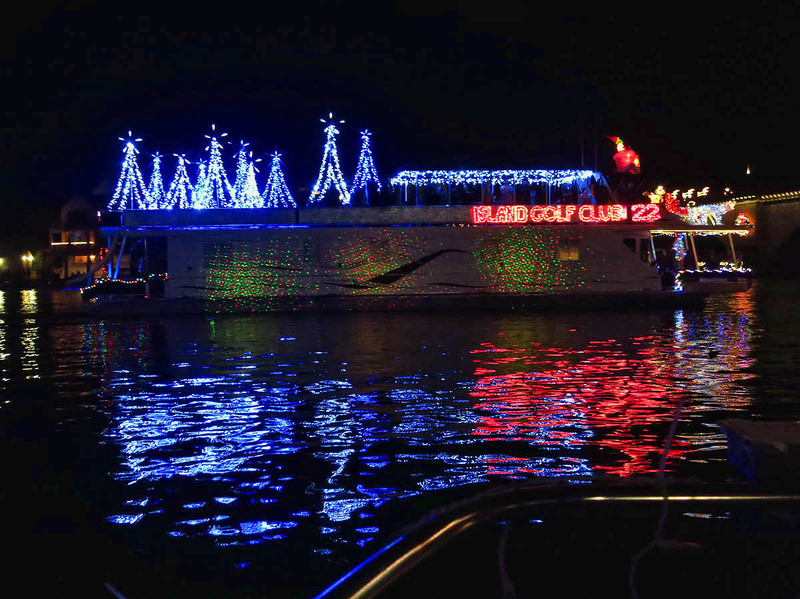 We would be motoring out the Bridgewater Channel to Thompson Bay, where all the floats line up in numeric order. 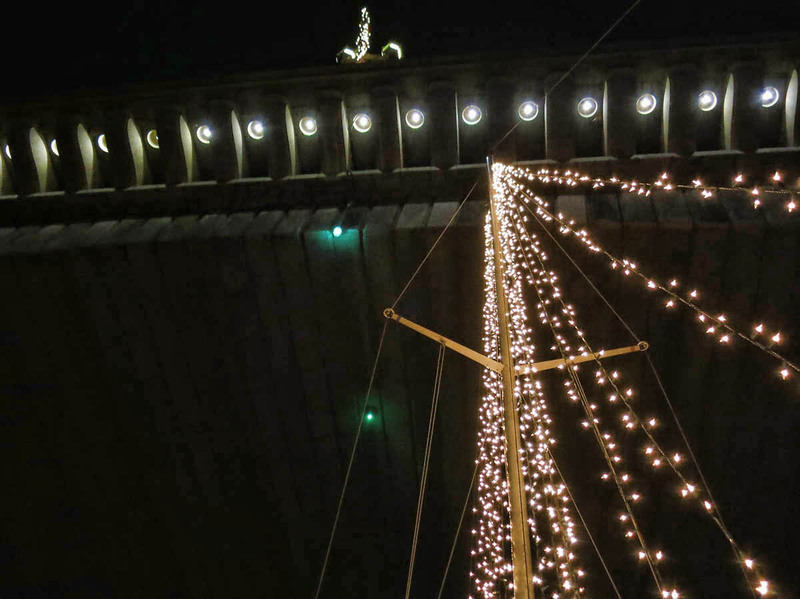 The sailboats are always the tail end of the parade, as most masts are too tall to clear the bridge. 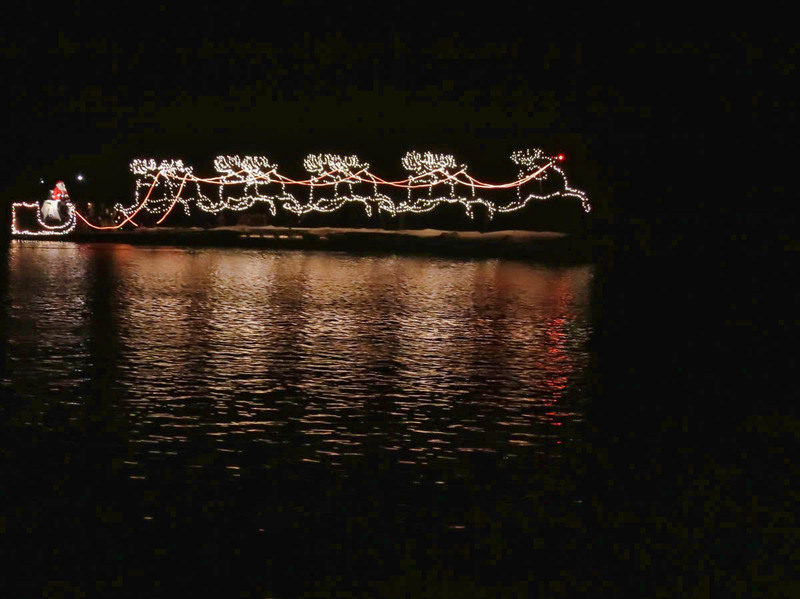 Santa’s sleigh is made up of four barges. 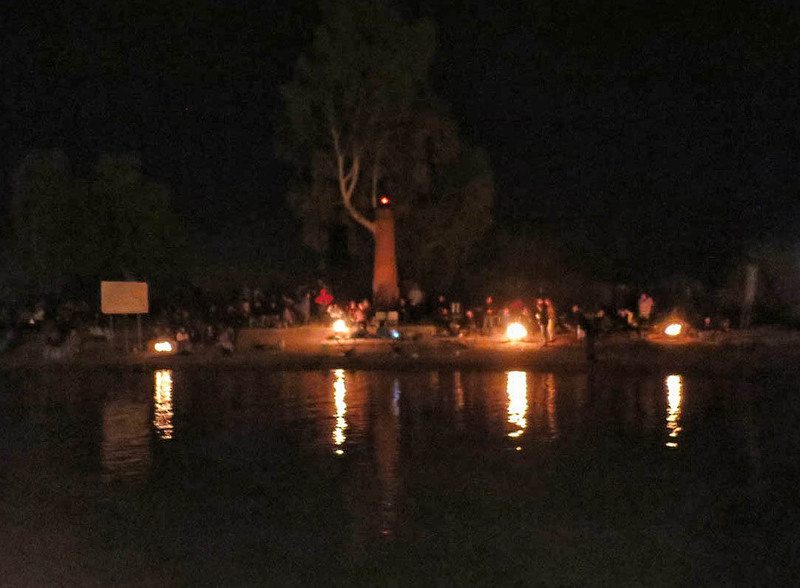 The banks of Bridgewater Channel are lined with bonfires. Final checks complete, we motored out to the bay and circled up to wait our turn to follow the parade through the channel. 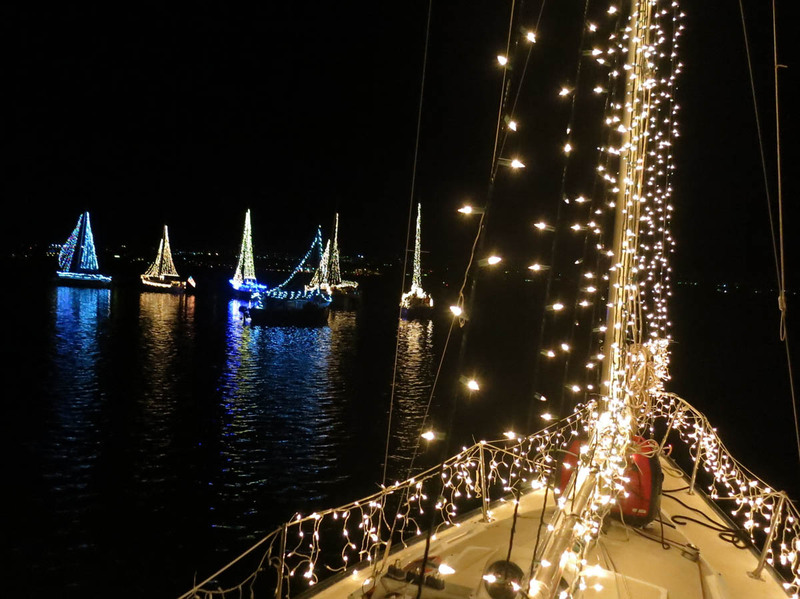 The beach side of the island was lined with bonfires as groups of families and friends huddled around the fires, waving and shouting “Merry Christmas” as we motored by. 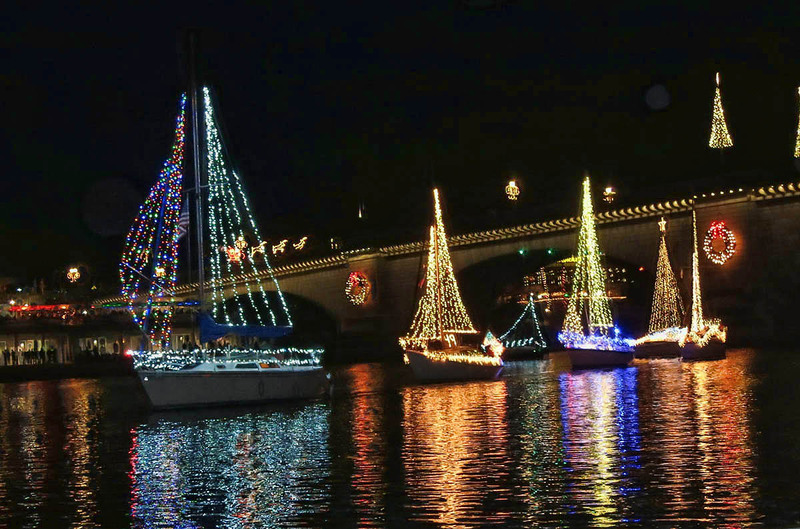 The sailboats were tied together in a towing formation with the exception of Captain Kathy’s boat. It has a fixed keel, so we remained “unhitched” to avoid running aground while being towed. 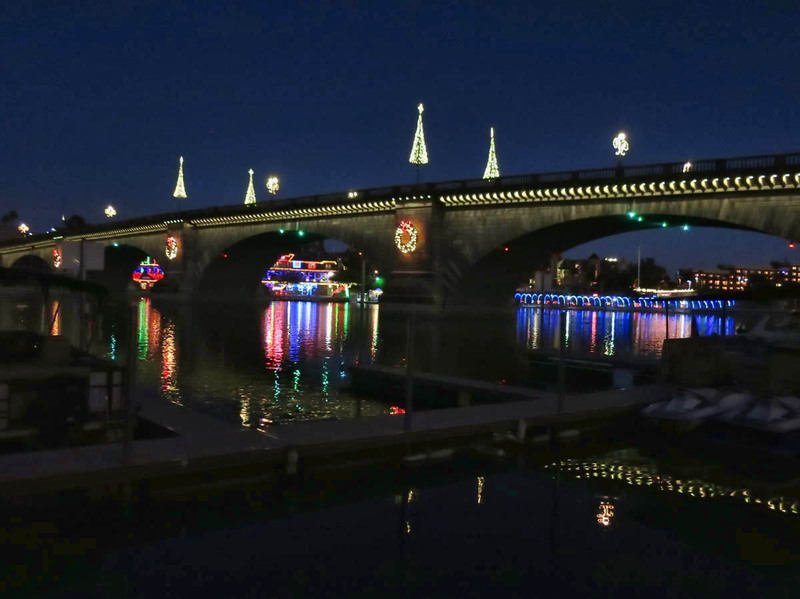 However, this also allowed us the freedom to “go rogue” and motor under the London Bridge while the remaining sailboats circled, waiting for the floats to complete their route beyond the bridge to Windsor Beach and back. Looking up the mast as we cross under London Bridge. Captain Kathy says “Don’t worry, we’ve got two feet.” I am skeptical, but no problem! Having the opportunity to ride in the parade was a thrill beyond expression. 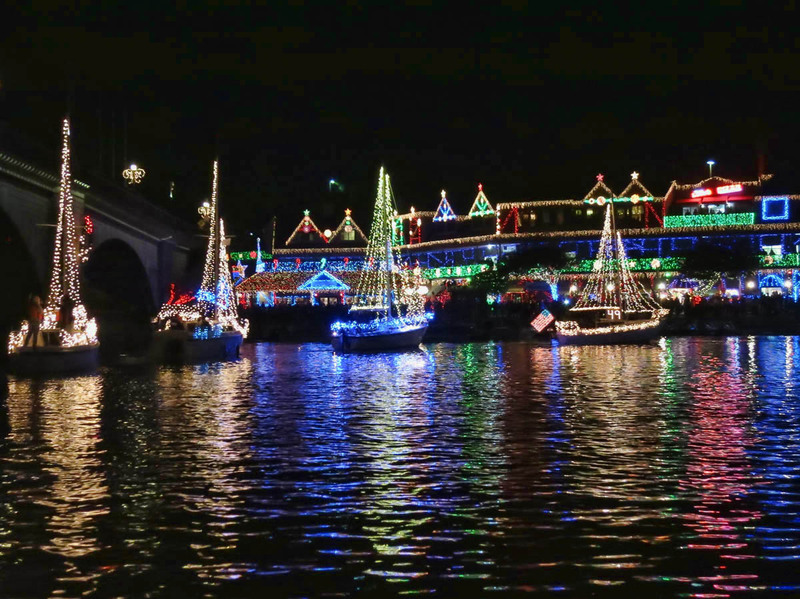 I get excited just being around sailboats, but to get to ride on one in the light parade raised my excitement level exponentially. However, participating in the parade is not the best scenario for actually viewing it. 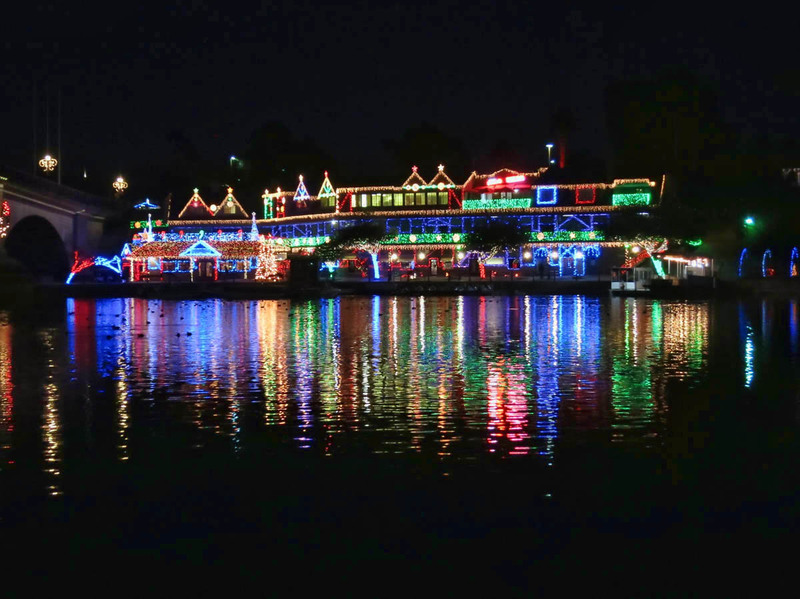 So the second night, we watched from the dock, enjoying the best of both worlds. And since the second night of the parade was not an official Sea Scout event, mass quantities of adult beverages were imbibed. 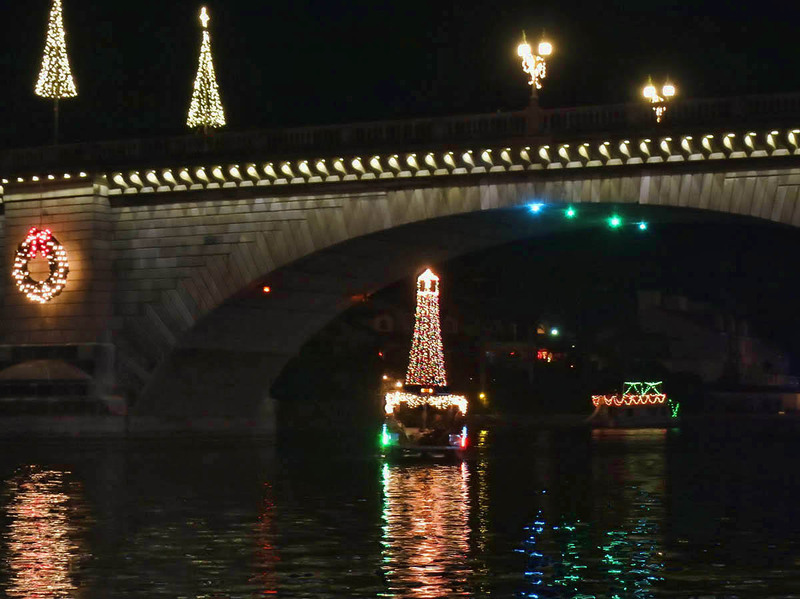 Sitting front and center on the dock with Kathy, Joel, and their friend Carol, watching the parade boats pass by while popping the corks of a few champagne bottles will be one of my most treasured memories of 2015! 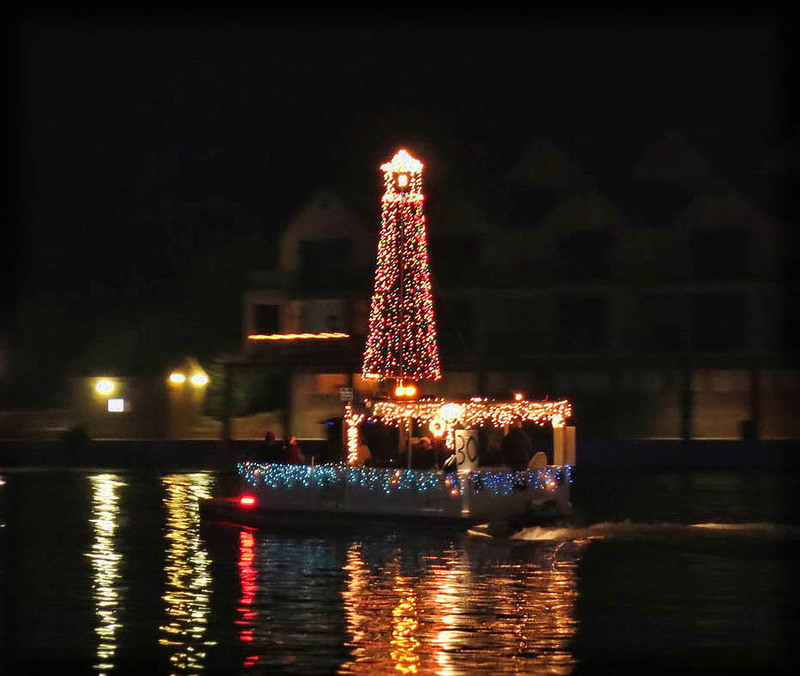 Of course, my favorite float is the lighthouse! Lighthouse float is worthy of a second photo. This one won “Best Sparkle” award. Happy Winter Solstice, everyone! My favorite equinox when we pass through the longest night of the year. I always appreciate this annual milestone, as the days will never be any shorter than they are today. Tomorrow, the tilt of the planet’s axis begins pointing us toward the sun, giving us a little over two additional minutes of sunlight each day from now until June. As someone who is “solar powered” both in body, mind, and home, this shift is always a welcome relief. Bring on the light! I would also like to take this time for a heartfelt thanks to all the friends and followers of the Take to the Highway blog in 2015. Your comments and emails of support through the ups and downs of this turbulent year have meant the world to me and my family. My very best wishes for a Happy, Healthy, Harmonious Holiday Season to each and every one of you, regardless of which holiday you celebrate. It’s a great time for reflection and gratitude, to love and be loved, and to set our intentions to make 2016 a joyous year! 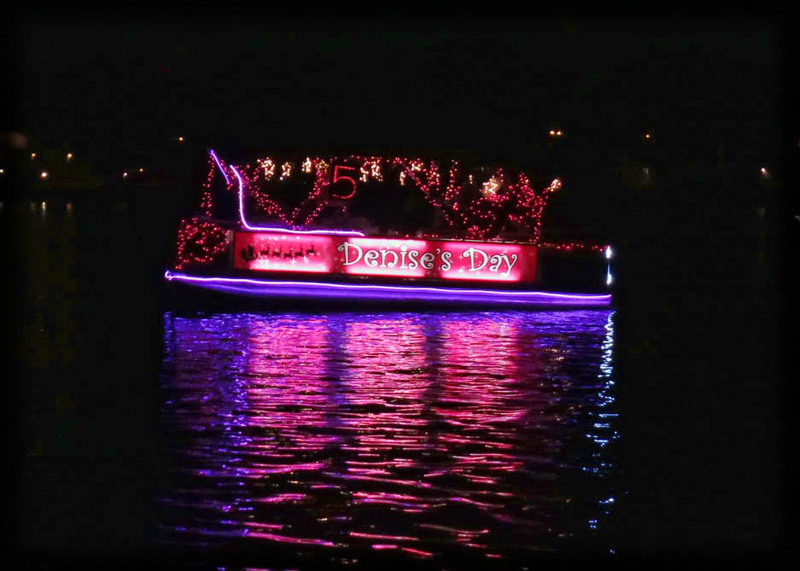 This entry was posted in Arizona, State Parks and tagged Lake Havasu Boat Parade of Lights by Suzanne. Bookmark the permalink. And a Merry Christmas and Happy New Year to you Suzanne. Maybe we’ll meet in 2016. What a fabulous capture of this event! I felt like I was actually there!! As always, you bring it right into my brain to enjoy to the fullest. Best wishes to you and your family. Hope you have a grand time in Texas. Merry Christmas to you and yours. When you return to your RV, maybe we could cause our paths to cross. Safe travels. An excellent parade and really cool to be part of it. So glad to have met you this year and hope it happens again next year, and beyond. Thank you for the beautiful photos and prose throughout this past year. Merry Christmas! Thank you for sharing your adventures this year. I get so much inspiration from your blog. Didn’t know about the light parade. Gotta get there someday. 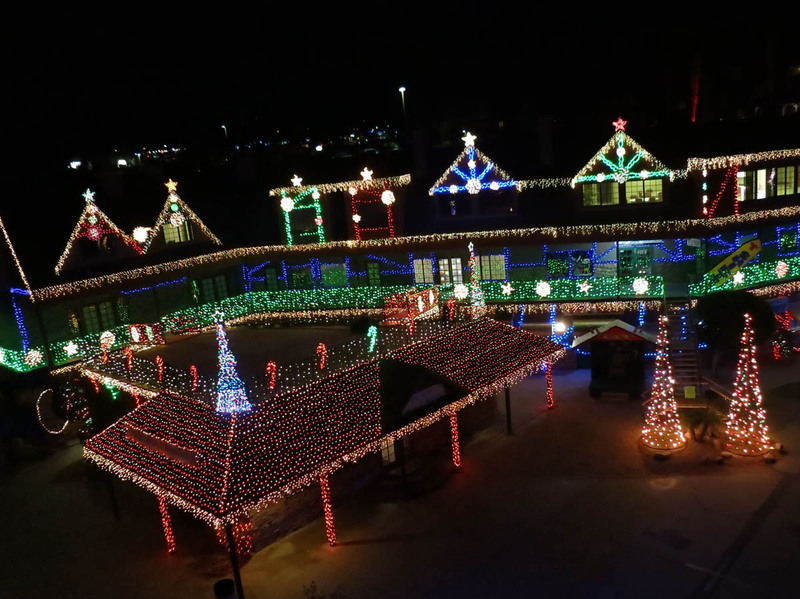 We have a light parade in Los Alamos, but it is at 7,500+ feet in N. New Mexico and usually snowy. Can’t wait to read about your 2016. Peace! Thanks for your wonderful blog. Merry Christmas. Looking forward to your travels in 2016. Cheers to a Joyful 2016! I, too, LOVE a parade, and this one looks outstanding. I’m so glad you got to be part of it. What a wonderful memory! Merry Christmas, Suzanne, and a Very Happy New Year! Hope we meet up again in 2016! Suzanne, you have been so much on my mind lately … and now that I read your solstice post, I realize we must be “sun sisters”. Yes, this is a time to look toward the light and I have to say that you definitely celebrated the solstice in a most delightful way. 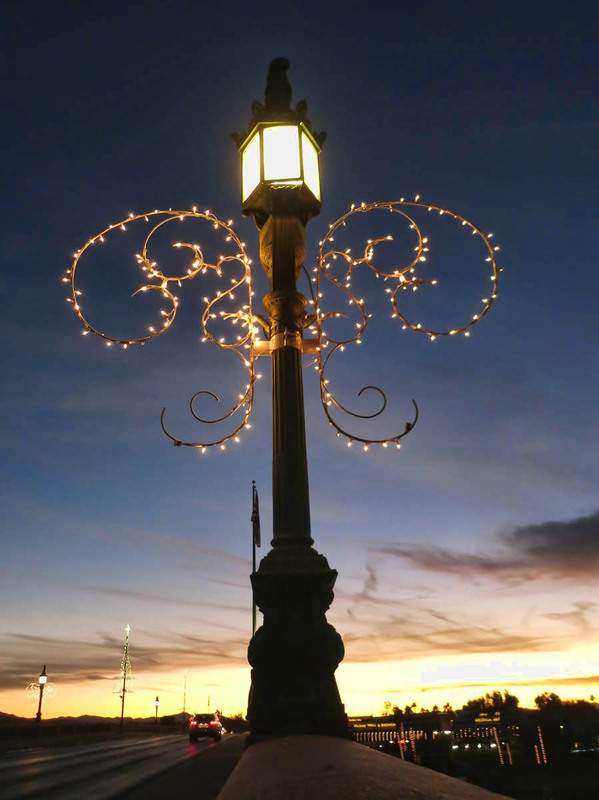 May the glow of light and love be with you during this time of year and hope to maybe cross paths with you in 2016. I’d never heard of that parade. Definitely worth seeing (bucket list). And what an incredible opportunity to be part of it! Thanks for sharing. Not sure how that parade could have been any more wonderful than your pictures of it. Just fantastic! I can sure see why you would want to be there and having a dinner invite from friends would seal the deal for me. As you know, the Solstice is my winter holiday. SO glad to see the days increasing even if ever so slowly. Really hoping 2016 will be a soft and gentle year for your family. Joyous Solstice to you Suzanne. Happy New Year to you, I’m excited to see what the year holds in store for you. Found your blog through Jim and Gayle. Love the pics. Am in LHC now for the first time & am looking forward to seeing the London Bridge. Best wishes for a great 2016!